Margaret Thatcher and Clement Attlee have been ranked as the greatest prime ministers of the 20th century by a historian in BBC History Magazine. Giving the leaders points from zero to five, Francis Beckett put Tony Blair mid-table with three, saying his Iraq war policy affected his standing. The list was based on how well the leaders implemented their policies - not on the policies themselves. 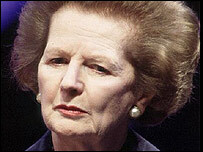 Lady Thatcher "took one sort of society, and turned it into another". Ruling from 1979 to 1990, her victory over the miners was highlighted as a key moment by Mr Beckett. "Today few people under 40 remember a time when trade unions were a real force in the land, when the public sector controlled large swathes of the economy, when local councils controlled education and other local services, when benefits were considered rights of citizenship," he said, giving her five marks. Attlee, who also scored five, was the Labour Party leader for 20 years, and presided over the 1945-51 Labour government. This was the most significant reforming administration of 20th-century Britain, the regime that introduced the National Health Service, nationalised one-fifth of the British economy, and granted independence to India. Mr Blair, who scored three points, had made a lot of progress up until the invasion of Iraq in 2003, Mr Beckett concluded. "The private sector has now been brought even into the running of schools and hospitals and, since the Conservatives agree with it, this will probably be a relatively permanent change." But he added: "The unpopularity of the Iraq War, and the fact that the reasons given afterwards for going to war were not those given at the time, have undermined Blair's ability to implement his vision, probably permanently." Sir Winston Churchill received four points, as did Edward Heath and Harold Macmillan. Churchill was voted the greatest Briton of all time in a 2002 nationwide poll, attracting more than one million votes. And in a recent poll of 1,000 for Doctor Who Adventures magazine, he was the historical figure people would most like to travel back in time to meet. Of the 20 prime ministers in the list, Neville Chamberlain and Sir Anthony Eden both scored zero - in Chamberlain's case because he "utterly failed in his principal objective of averting war".